"An Teallach - Flickr - Graham Grinner Lewis" by Graham Lewis - An Teallach. "Fortrose Harbour - geograph.org.uk - 24870" by Bob Jones - From geograph.org.uk. 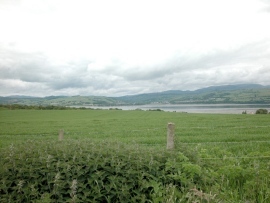 "Towards Dingwall - geograph.org.uk - 34820" by Dennis Turner - From geograph.org.uk. 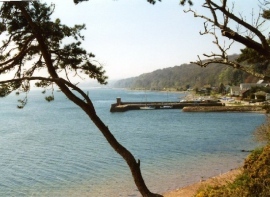 "Wilkhaven Jetty - geograph.org.uk - 19220" by Bob Jones - From geograph.org.uk. 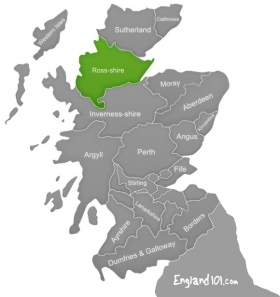 Ross-shire is a historic county in the Scottish Highlands, bordering Sutherland, Cromartyshire, Inverness-shire and Nairnshire. 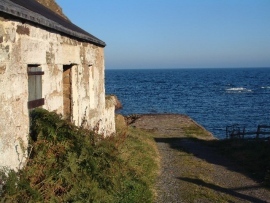 In this region you can watch dolphins play in the wild, enjoy some incredibly beautiful views and learn all about Pictish art. Bealach Na Ba Road is famous in the area for being both stunningly beautiful, and treacherous. The single track roads, hairpin turns and sheer drops on the side of the road make this drive unsuitable for the fainthearted. Especially when it is foggy! It winds its way up the side of a hill, through an astounding large valley and then the sequence of hairpin bends hit you; at which point you reach the top of the mountain and have a similar experience back down. However, the glorious views are constant and breathtaking. Put simply, Chanonry Point is the best place in Scotland to see bottle-nose dolphins. The best time to arrive is an hour before high tide, and your eyes will feast on the sight of these gorgeous creatures playing, swimming, jumping out of the water and catching salmon to eat. You might also be lucky enough to see seals as well. The beach is stunning during low tide, offering a large stretch to enjoy a walk or a picnic. Rosemarket Beach is another spot to potentially see dolphins in the bay. It is mostly a sandy beach, with some pebbles and interesting rock formations, and some rock pools too. There is a café run by local volunteers, which also houses a little exhibition room. 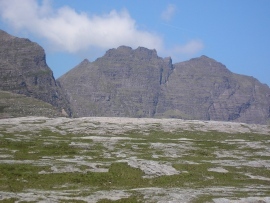 Glen Torridon is considered one of Scotland’s most beautiful glens. 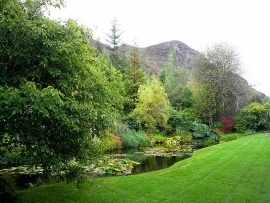 There is a wonderful sense of isolation, the scenery is utterly magnificent and the visitor’s centre offers a great choice of marked paths to enjoy it all. The walk around the hill from the main car park will give you spectacular views of the Triple Buttress. Even if the weather isn’t great, it is still worth a visit because the mist and fog only adds to the mystery of the glen. Groam House Museum focuses on Pictish history and the displays mainly showcase the sculptural art of the Picts, including the Rosemarkie cross-slab. The museum also houses the George Bain Collections, which is recognised as being of National Significance. George Bain created a mathematical structure to work out how the intricate carvings of the Pictish sculptures were created. Exhibits for children here include making rubbings of the ancient Pictish stones, and playing the harp.